RIP Karma – we hardly knew ye. In an earnings report today, GoPro revealed that it will be pulling out of the camera drone business, ceasing production of its Karma drone and exiting the market once it has sold the last of the inventory. Citing the extremely competitive aerial market, GoPro said that Karma’s success in reaching number two in market position was not enough to keep it viable. The firm also blamed a “hostile regulatory environment” for drones in the United States and Europe. 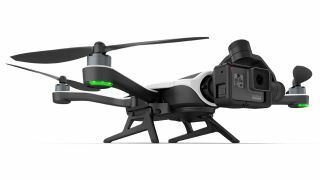 The GoPro Karma was launched with much fanfare back in September 2016, but almost immediately stumbled, with technical issues (namely drones falling ignominiously out of the sky) necessitating a product-wide recall in November. The delays allowed rivals such as DJI touting similar products to gobble up the market share, and Karma never recovered its momentum. Reviews were accordingly unkind, with many critics savaging the somewhat wince-inducing price point of $799 in particular, a figure that contrasted with its rather basic feature-set. GoPro ended 2016 with serious financial losses (to the tune of $343 million) and has been course-correcting ever since. Having recently returned to profitability in 2017, GoPro is engaging in some company-wide belt-tightening in order to keep things that way. Founder and CEO Nick Woodman is reducing his 2018 salary to $1, and the firm is undergoing a restructure that will see its worldwide workforce reduced from 1,254 as of September 2017 to fewer than 1,000. The earnings report also details how the firm was forced to slash the price of the Hero 5 Black – from $499 to $399 – in order to encourage sales throughout the holiday period, ending the final quarter of the year on a lower-than-expected $340 million. This was, according to the company, the firm's worst holiday period yet, and showed it to be still in trouble, despite the uptick in its fortunes. The restructure is expected to take place mostly through the first quarter of 2018. GoPro says it will continue to provide support and service to existing Karma customers. Other than that, however, the company will be keeping its feet firmly on the ground.